When an individual discovers that they are gluten sensitive or diagnosed with an autoimmune disease and must avoid gluten or grains, they often fear that they won’t be able to have their favorite bread, baked goods, or desserts anymore. Luckily things have changed, and there are several wonderful gluten free and grain free flour alternatives available. All it will take is a bit of trial and error, and you can replicate your favorite bread and desserts in no time— without the inflammatory effects of gluten and grains! Almond Flour Pros: Almond Flour is perhaps the most well-known grain free flour alternative. It is an excellent source of protein and prebiotics and is a good alternative as all-purpose flour. It has a nutty taste and has a 1:1 substitution in cakes, cookies, and bread. And, you can find almond flour at most grocery stores. Almond Flour Cons: Almond flour is a “heavier” flour so you will need to add more leavening agent to your recipes than what is called for. Unfortunately, not all brands of almond flour will achieve the same results so finding a good brand or making your own almond flour yourself at home is imperative. Cassava Flour Pros: Cassava flour is made from the yucca root, is incredibly rich in prebiotic fiber and has an incredible nutritive profile. It also has a 1:1 substitution to wheat flour in almost every single recipe that calls for flour imaginable, making cassava flour the ultimate gluten-free and grain-free flour alternative. The final result is sure to have a great texture. Cassava Flour Cons: Some cassava flours are produced in a way that does not give them the ideal consistency, and they do not have a 1:1 substitution with wheat. Although grain free cassava flour is not as widely available as almond flour or coconut flour, it is still available online and in natural food stores. Coconut Flour Pros: Coconut flour is made from the meat of coconuts and is an excellent source of dietary fiber and is often recommended for diabetic individuals. Coconut flour is an excellent thickener in gravies and soups with a stronger flavor and is widely available in grocery stores and online. Coconut Flour Cons: Imparts a strong coconut flavor to baked goods and dishes. Because coconut flour varies so much from producer to producer, you will need to trial and error recipes using coconut flour. Due to the fibrousness of the flour, it will require extra egg, applesauce, or oil to keep your recipe moist. Tiger Nut Flour Pros: Tiger nuts are not actually nuts, but are tuberous roots, related to potatoes. In fact, Tiger nuts are high in prebiotic fiber and protein and may improve digestion, regulate blood glucose, and improve fertility. The taste of tiger nut flour is nutty and sweet, almost chestnutty. In baking, tiger nut flour has a 1:1 substitution ratio to wheat flour. Grain Free Tiger Nut Flour may be used in many applications, from smoothies to pancakes to brownies and dessert tarts. The uses of tiger nut flour are endless! Tiger Nut Flour Cons: A bit of trial and error is required to perfect your favorite recipes. Although tiger nut flour is not as widely available as almond flour or coconut flour, it is still available online and in natural food stores. Green Banana Flour Pros: Green Banana flour is perhaps one of the most obscure, and underutilized of the gluten free and grain free flour alternatives available. Green banana flour is made from unripe green bananas and is packed with nutrients such as potassium, and resistant starch. It has a neutral flavor and is often added to smoothies for the benefit of boosting fiber in the diet, and may have other metabolic benefits. Green Banana Flour is also used to make baked goods like pancakes, bread, cakes, and muffins, and as a starch for thickening gravies and sauces. Green Banana Flour Cons: Green Banana Flour cannot be substituted 1:1 in recipes that call for wheat flour. For baking purposes, you must use 1/3 cup less green banana flour than wheat flour. Green Banana Flour is not widely available in grocery stores but may be available in your local natural foods stores, and available online. As always, experimentation is key to having success in recipes that use gluten free and grain free flour alternatives. 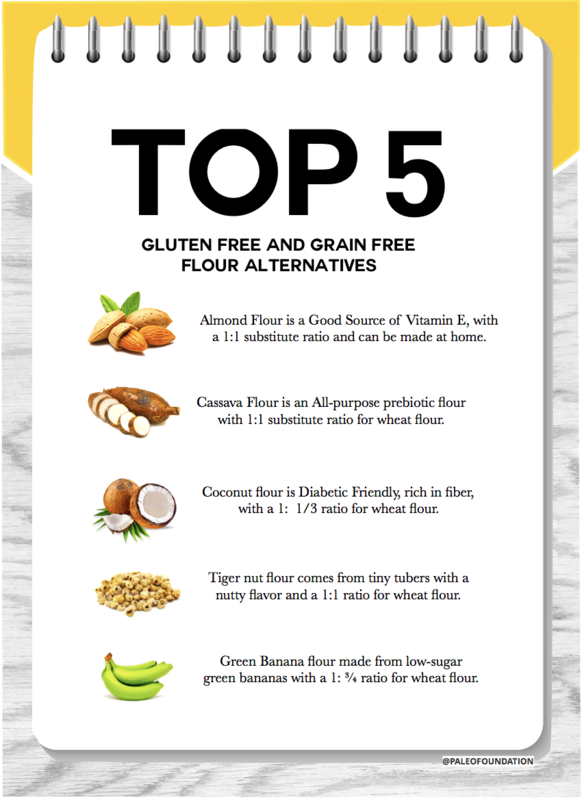 It is important to note as well that individuals with blood glucose regulation issues must consider using these gluten free and grain free flour alternatives in moderation. However, some of the flours have been shown to help regulate blood sugar and cholesterol levels, as well as the gut microbiota. As such, individual sensitivities may vary and self-experimentation is warranted. 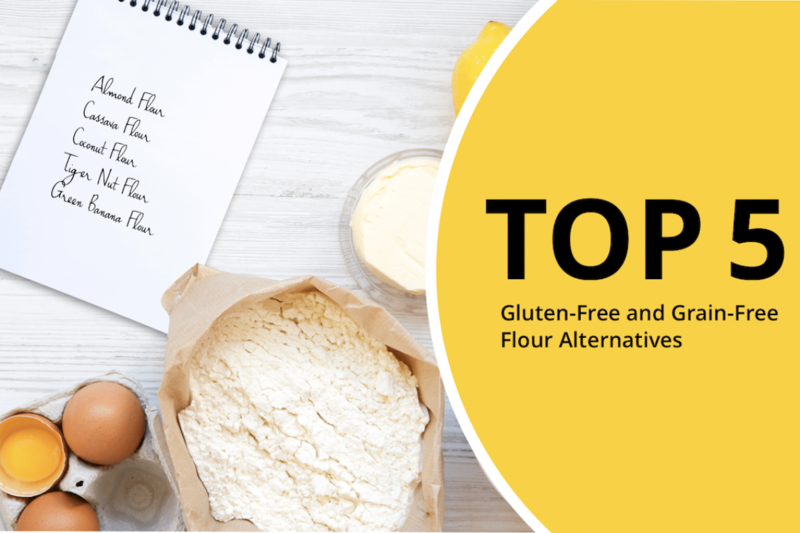 If you are choosing to use a gluten free and grain free flour mix, it is essential to read the ingredients, as many companies often add other flours or fillers into the mixes that may not be gluten free and grain free. Previous article Are Grains and Pseudograins Healthy? Next article What is Gluten?